Besides the typical tourist things to do there are more outdoor related activities. This time we were able to drive down Highway 1 and actually see a little bit of scenery as the fog wasn't as heavy as the first time we made the attempt. 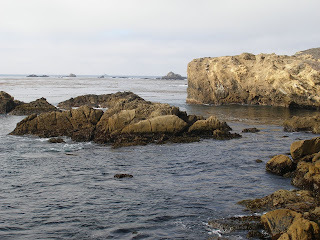 One of the great places we stumbled upon as we drove down Highway 1 was the Point Lobos State Reserve located south of Carmel. The cost to enter is $10.00 per car. The scenery was more than worth the price of admission. The reserve is a beautiful and interesting place. There are a number of hiking trails of varying lengths and activity level. 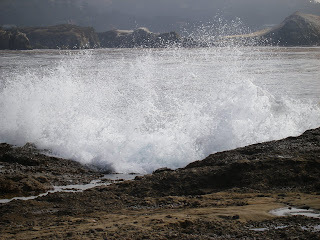 My favorite places at Point Lobos were the ones bordering the ocean. Besides hiking the trails, you can also enjoy water-based activities in designated areas. Much of the reserve is underwater, so if you are a diver, you will get to see more than the average tourist. 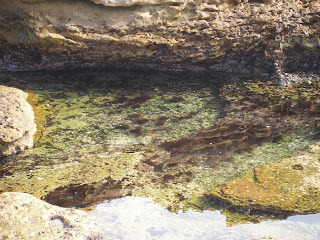 There are some great tidal pools to look at. 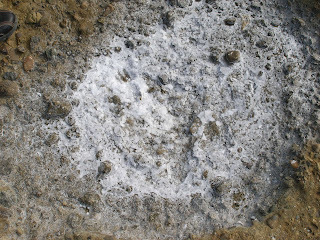 When we were exploring the tidal pools we saw some spots were salt had accumulated from the sea water evaporating. 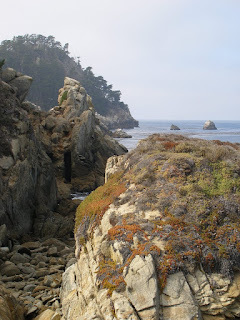 Besides exploring places like Point Lobos and other scenic spots. You can also enjoy outdoor pastimes, such as golfing, boating, kayaking, diving, horseback riding, and more at various venues throughout the area. I'm not really into too many outdoor activities, besides taking pictures and admiring the scenery. Walking is really the extent of what I like to do, although I wouldn't mind cycling, as long as I didn't have to pedal up a mountain. I am a big fan of the driving tour, getting out occassionally to explore...there are lots of places to go by car and beautiful scenery abounds. If you do get tired of the outdoors, you can go shopping or to see a movie. In Monterey along Cannery Row, there is now an IMAX 3D theater. We didn't go, but this is a new attraction. There's a regular movie theater at the Del Monte Center, the shopping mall in Monterey. If you get tired of the boutiques and tourist shops, you can get your fix of regular mall retail at the Del Monte Center, located off Munras Avenue (the main drag). 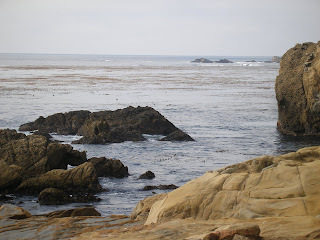 If you do like going to small shops then you might want to visit Carmel-by-the-Sea, which is full of high end boutiques or Pacific Grove, which has a main strip of small shops on Lighthouse Avenue. I like to visit A Nyche in Time, which is a shop in Pacific Grove that sells new and estate jewelry at bargain prices. Since I make jewelry, I like to look at the gemstone pieces the store offers; the last time I visited I saw that they now feature jewelry made by area artists. Monterey itself also offers a number of small shops outside of the tourist strip. More shopping, especially chain stores, can be found in the nearby communities of Seaside, Sand City, and Marina. 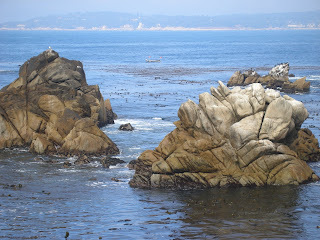 The area surrounding Monterey is also known for a number of wineries, many of which offer tours. Monterey even has a Wine Trolley, which takes you on a wine tasting tour of some area wineries. I'm not into wine myself, so probably wouldn't do this, but I do find wine making fascinating. If I can find a good tour of a winery that really educates you about the wine making process, I will probably do that one day...I'll be sure to report on it. Other area tours include various walking tours, including a ghost walk; a ghost trolley tour, and the Monterey Movie Tour, which takes you to various locations made famous by a number of films shot in the area. And, after all of the shopping and activities, you'll need some relaxation time and pampering. The Monterey area offers plenty spa choices. If you are staying at the Monterey Bay Inn or one of their sister establishments, you can even get some in-room spa services. Also located on Cannery Row is the Monterey Plaza Hotel & Spa which is located on the top floor of the hotel and features and outdoor sun deck. 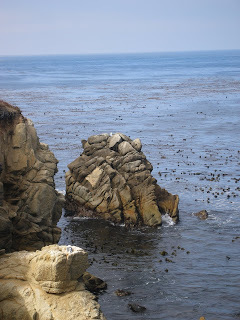 Believe me, there is plenty to do on the Monterey Peninsula, you'll have a great time and won't be bored...so go!